Fluke 115 vs 117 True RMS Multimeter - Which is better? Having a digital multimeter is vital for many modern professions. Technicians, engineers, and computer network specialists won’t be able to function properly without it. Digital multimeters are needed for various testing and troubleshooting cases. In this article, we will discuss the comparison between two popular digital multimeters, which are Fluke 115 vs 117. Which one is better for you? Fluke 115 and Fluke 117 look very similar to each other. Each of them comes with a yellow housing and a black front panel. The dimensions are, in fact, identical. Each of them measures 6.57 x 3.31 x 1.82 inches (167 x 84x 3.31 x 1.82 inches (167 x 84 x 46 mm). Each of them weighs approximately 550 grams. Both are compact and lightweight units which you can easily bring along wherever you go. See also: Saitek X52 vs X52 Pro. The manufacturer has optimized these models to be compact, portable, and ergonomic for easy one-handed operation. This is very convenient. When doing a field work, you often need to multi-task between your hands, so the simple one-handed operation is a big advantage. Each of Fluke 115 vs 117 has a large selector knob on the front. This selector knob is easy and intuitive to use. Whether you are trying to measure voltage, current, capacitance, or resistance, you only need to move the selector to the right position. Both Fluke 115 and Fluke 117 come with backlit LED displays that allow you to work in low-light conditions. You can activate and deactivate the backlight by pressing a button. Both Fluke 115 and Fluke 117 are also CAT III 600V certified. In other words, these models have been tested for the accuracy and safety when performing measurements in household environments. So, these are great options for home owners as well as professionals who work with installations with home voltage. The measurement ranges and reading options are similar.Most of the features of these two models are similar. However, there are a few additional features that Fluke 115 doesn’t have but Fluke 117 has. Depending on your purpose, these additional features can be very useful. Both models here are True-RMS Multimeters that give accurate and reliable answers. Both models have 6000 count resolution, and are able to measure True RMS voltage and current, resistance, capacitance, and frequency. The measurement ranges and accuracy levels on Fluke 115 and Fluke 117 are identical. Both models are able to measure DC and AC voltage of up to 6000 Volts. In addition, both models are also able to measure DC and AC current of up to 10 Amperes. Even so, you don’t need to worry in case of an overload, as they both can withstand overload of up to 20A for up to 30 seconds. The resistance measurement range is from 600 Ohms to 6 Mega Ohms. The capacitance measurement range is from 1000 Nano Farad to 9999 Mikro Farad. The frequency measurement range is from 99.99 Hertz to 50 Kilo Hertz. With such wide measurement ranges, Fluke 115 and Fluke 117 are ideal for a wide range of field tests. They can provide accurate and quick verifications of measurements when needed. Both models can handle fluctuating signals very well. Each of them can show you the minimum, maximum, and average levels of the signal within the elapsed time. Both models are also compatible with the ToolPak magnetic hanger, which allows easy hands-free operation. A difference between Fluke 115 vs 117 is that Fluke 115 does not have the Low Input Impedance (Lo-Z) function, whereas Fluke 117 has. The Lo-Z function is very useful for preventing a false reading that may be caused by ghost voltage. 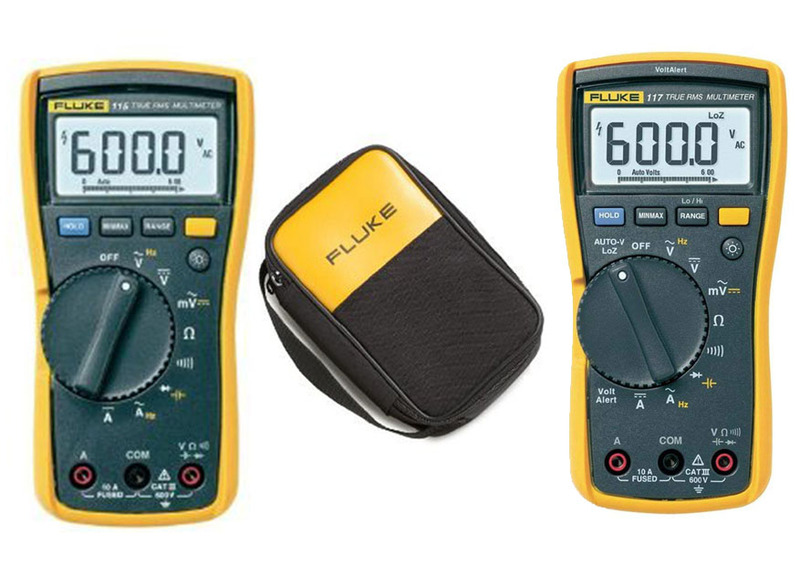 As the effect, Fluke 117 is generally more reliable and more accurate than Fluke 115. 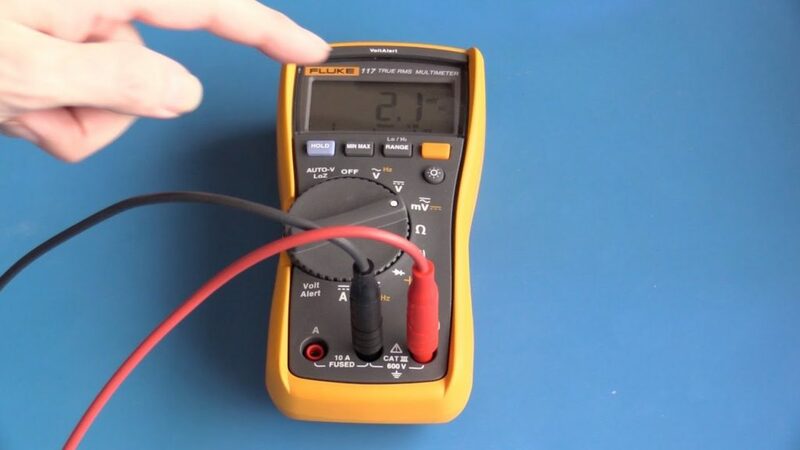 In case that you are wondering, ghost voltage is that voltage that still exists even after the circuit is disconnected from the electrical source and has absolutely zero current. There are some possible factors that contribute to this issue, and one of them is the input impedance of the digital multimeter. Large input impedance may lead to a faulty reading. However, Fluke 117 has an option to let you switch to a low input impedance mode for an accurate reading. Next, Fluke 115 does not have the AutoVolt feature. You have to select the correct measurement manually. This is very time consuming when you don’t know the voltage range of the circuit, as you will need to test from the highest possible level. Not to mention the risk that making a wrong voltage selection may damage the unit. With Fluke 115, you have to do the measurement the traditional way with probes. On the other hand, Fluke 117 comes with the AutoVolt feature. With this feature, Fluke 117 can automatically detect and select the right DC or AC voltage measurement. This is incredibly useful and convenient. When you have no idea about the voltage range of the circuit, you just need to select the AutoVolt position on the selector knob. In addition, Fluke 117 comes with the VoltAlert technology. This is a very cool feature. With this feature, you can perform non-contact voltage detection. You only need to bring the unit close to the circuit to detect the voltage, without using probes. This is very practical. It can save you quite some time when working. These digital multimeters use the same type of battery. Each of them runs on a 9V alkaline battery. The battery life is excellent. Each model can last for about 400 hours per battery if the backlight is not activated. However, if you often use the backlight, the battery life will certainly become shorter. Each model here is protected by a 3-year warranty. This is very good. The warranty timeframe is quite long, and it is a proof that the company is confident of the quality and durability. 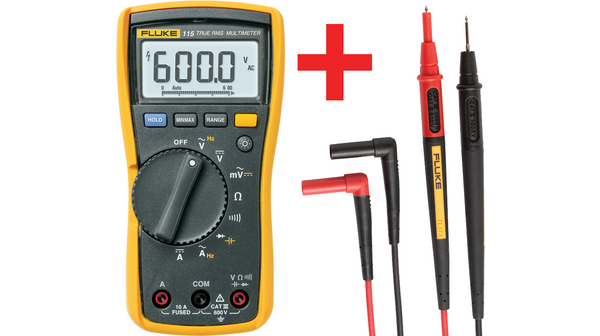 Between these two models, Fluke 117 is certainly more recommended. It comes with better features. It has the Lo-Z function to prevent ghost voltage for more accurate and reliable reading. It also has the AutoVolt feature to select DC or AC voltage range automatically, and the VoltAlert feature for non-contact voltage detection.